Because we want you to live on your furniture, we know accidental damage may happen. And when it does, help is just one call or email away with the Peace of Mind Protection Plan. Plans are available for fabric, leather and wood furniture, as well as for adjustable bed foundations. If you purchase a plan and don't use it, you'll receive an in-store credit from Slumberland in the amount of the plan value you paid. Please note that coverage is limited to accidental occurrences of damage, stain or breakage. Damage in the course of delivery, normal wear and tear and manufacturer defects are not covered under the Peace of Mind Protection Plan. See plan terms and conditions at time of purchase for additional information. You will have the opportunity to accept the terms or decline your plan purchase before completing your order. For every furniture item you add to your cart that is eligible for the 5-year plan, you will automatically have the option to add the plan to your cart. Pricing will be displayed in-cart. 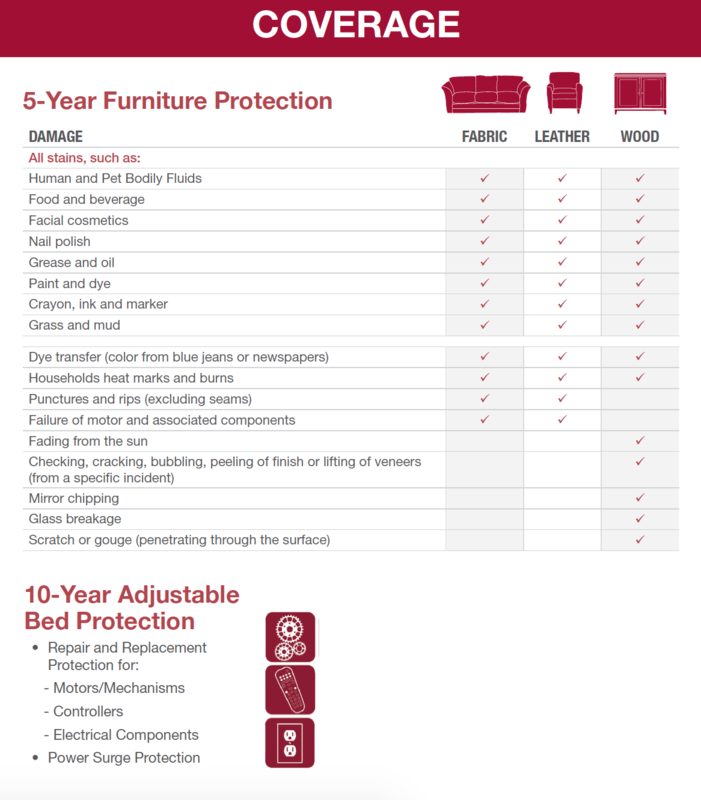 Please note: because of the complexities of adjustable bed coverage, please call or visit your local store to add the 10-year adjustable bed plan to your order. Your protection plan will be automatically registered at the time of purchase. This service provides you with a shorter claim filing time if you ever need to report an accident. If cleaning or repair is needed, in-home tecnicians from GBS Enterprises provide high-quality craftsmanship and professional services. In the event that your furniture cannot be repaired or cleaned, you will receive a replacement.